There are several different methods that are popular for creating woven bead necklaces: a figure-8 style of finger weaving, spiralling half-hitch macrame, and flat square-knot macrame. My preferred technique for this necklace uses all three stitches! 1. Each half of the necklace is woven separately, starting at the ends and working towards the middle. For the loop, I used figure-8 finger weaving, starting in the middle of my cords, and then folded them in half and proceeded with square-knot macrame for an inch or so. 2. 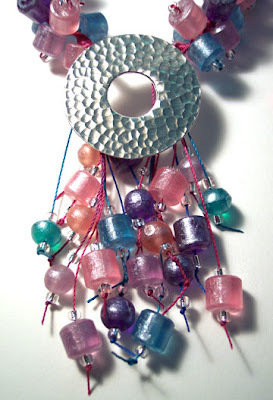 Once I began adding beads, I switched to half-hitches so that the work would spiral around. 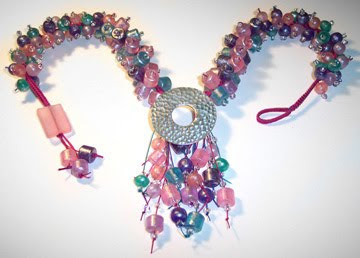 Beads are added only to the central cords, not to the outside working cords which are used only to do the knotting. It takes a little trial and error to figure out how many knots to add between each bead. For this necklace, I used a 8/0 seed bead to anchor each resin bead in place. 3. When each half is as long as you desire, switch back to square-knots to make sections long enough to pass through the pendant bail from opposite sides. Knot the cords to keep them from slipping back through, and add more beads to the ends of the cords to finish. These are not terribly detailed directions, because there are so many variables that must be considered. Also, there is a wonderful book that is available to teach the finger-woven method, written by Robin Atkins. My method is highly trial and error, and lots of errors went into figuring out how I wanted to make this particular necklace. The next one will be different, I’m sure! My best piece of advice is to start with a smaller piece like a bracelet, or even just a small sample that you’ll cut apart when you’re done. That way you can figure out how much cord you need based on the tension you keep in knotting and the size beads you use.